Activists at the Take Back Chicago rally ripped Mayor Rahm Emanuel’s policies—and some of his City Council allies joined in. 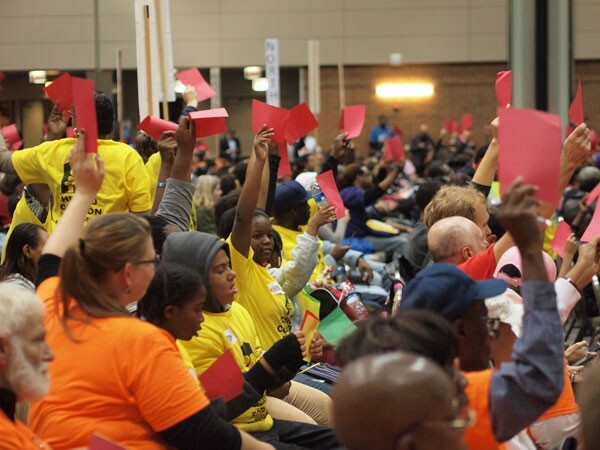 The pinnacle of last week's Take Back Chicago rally at UIC came near the end, when the 11 aldermen onstage were asked point-blank whether they support pending proposals to slow privatization and tax increment financing deals. Yes or no? As more than 2,000 of the city's most dedicated activists looked on, the aldermen all said yes—even though a couple of them are among the most consistent council supporters of Mayor Rahm Emanuel. They then sat there smirking, as if to say, you can't trap me, because I'm too slick. Things got so absurd that Alderman Proco Joe Moreno—a reliable vote for mayoral initiatives—actually called on activists to join him in his "fight" against the administration. I don't think he was trying to be funny, but I laughed anyway. Even so, this outburst might be a cause for celebration if the privatization and TIF proposals actually had a chance of going anywhere. OK, everybody, I know these are dark days, and you've had to endure Mayor Emanuel taking the ax to things you really believe in, like public schools. I understand the need to take solace in any vague triumph you can claim, real or not. But getting an alderman to sign on as cosponsor of legislation that he or she knows will die in the City Council's rules committee is not a victory. Actually, it's sort of an insult, since it confirms the suspicions of many aldermen that voters will fall for any old line they dole out. I have a way out of this charade. But first let me examine the legislation in question. The privatization ordinance was drafted last year by Alderman Roderick Sawyer after the mayor fired 34 workers in the city's water department. Their duties were then farmed out to NTT Data, a company based in Japan. In other words, Japan gets the money and the south side gets the pink slips—in the name of reform. As Sawyer pointed out, many of the employees came from south- and west-side communities where unemployment hovers as high as 30 percent. So Sawyer drafted an ordinance that would require the mayor to "undertake a cost-effectiveness study" of any privatization agreement to determine if potential savings are offset by the costs of firing Chicagoans. Thirty-two aldermen signed on as cosponsors, including such mayoral backers as James Balcer, Marty Quinn, Emma Mitts, and Lona Lane, who probably wouldn't vote against the mayor unless their own wards were sold to the parking meter company. And even then they'd seek a mayoral permission slip in writing. Upon being formally introduced to the council, the privatization proposal was immediately assigned to the rules committee, which is where mayoral allies send legislation for burial. Emanuel doesn't want this bill to pass for the rather obvious reason that it would limit his ability to cut additional privatization deals. His backers all know that. But those who signed on get to say they were sponsoring a bill that looks out for the interest of regular Chicagoans. And the mayor gets to keep his power to divert money from Englewood to Japan. That's what Emanuel would call a win-win. By the way, when Sawyer introduced his ordinance, the chairman of the rules committee was Alderman Richard Mell. Guess who signed on as a sponsor to Sawyer's bill? That's right—Alderman Mell. It doesn't get much more cynical than that. The tax increment financing surplus ordinance suffered a similar fate. As I may have mentioned a few times before, the TIF program collects property taxes into slush funds controlled by the mayor—more money than the mayor has earmarked to spend. This surplus has existed for years. But recently Tom Tresser and his allies at the Civic Lab started tallying that surplus on the grounds that we should use every nickel for things we want—like schools and police. By their count, the TIF surplus adds up to $1.7 billion. By the way, to come up with the total, Tresser and his colleagues had to tally up the surplus from annual reports for each of the city's 160 or so TIF districts. That's because the mayor doesn't release an annual report for the TIF program as a whole. In any event, once Tresser started holding public meetings around town about the $1.7 billion surplus, Mayor Emanuel was compelled to explain why he was closing schools and firing teachers and not hiring police officers. The mayor responded by claiming that roughly $1.5 billion of the surplus was off-limits because it was set aside for specific projects—just take his word for it. Thus was born the TIF surplus ordinance, drafted by aldermen Robert Fioretti and Scott Waguespack. In this one, total TIF revenues that are not "already required" or "pledged for specific projects" shall be returned to the schools, parks, and city. Once again, 32 aldermen signed on, including the aforementioned Emanuel supporters Balcer and Moreno. Waguespack formally introduced it on July 24 and it was also shipped to rules. That's because money is power, and TIFs represent the largest source of discretionary money in the city. The less oversight the mayor has, the more money he gets to dole out to people who are then obligated to him. So as long as we're asking yes-or-no questions, ask yourself this one, taxpayers: Would this mayor ever voluntarily relinquish power? I didn't think so. So the proposal sits in the rules committee. But perhaps not forever. "There is a way to get a bill out of rules," Waguespack says. "Rule 41." "After 60 days in a committee, any alderman can call any legislation for a full vote of the City Council." Which means a yes-or-no moment with real meaning. That is, a full council vote on whether the full council gets to vote on important legislation. True, it's sort of a roundabout way of getting a vote on the bill itself. But it would force the aldermen to explain why they're voting against a bill that will essentially keep the mayor from outsourcing jobs to Japan. In short, it's a step toward real democracy, like you see on House of Cards. Here's my advice to Sawyer and Waguespack and all the other independents: invoke rule 41. I mean, you might as well use what little power you have. Will you lose the vote? Probably. If the mayor could get the council to reratify the parking meter deal, the single most unpopular ordinance of the century, he can get it to do anything. But at least you'll make the Morenos of the world take a stand. Hopefully, their constituents will be watching. The anyone-but-Rahm crowd throws a rally! Proco "Joe" Moreno bashes Rahm, Will Burns gets booed, Toni Preckwinkle is a no-show, and other observations from the big anyone-but-Rahm rally. Mayor Emanuel doesn't have to fight City Council proposals he doesn't like—he just buries them. What's really saved by privatizing a couple dozen positions at the water department?